Over the course of the next 18 months, construction workers will put the final touches on two World Trade Center towers, but a street that dwells in their shadow is already being transformed by an influx of new developments. 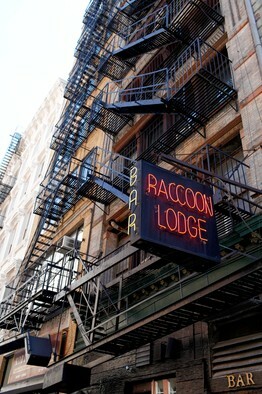 Warren Street has long enjoyed a robust mix of New York oddities, including a massive walk-in humidor for cigar lovers, the Fountain Pen Hospital and the Raccoon Lodge, a dive bar that became a gathering place for rescue workers after the Sept. 11, 2001, terrorist attacks. But these days, Warren Street—which sits on the southern edge of TriBeCa near the Financial District—is ceding some of that gritty charm to an influx of ultraluxury developments. The strip's development was kicked off by 101 Warren St., a glassy Skidmore, Owings & Merrill-designed tower with 227 condos and a Whole Foods, Bed Bath & Beyond and Barnes & Noble in the base. 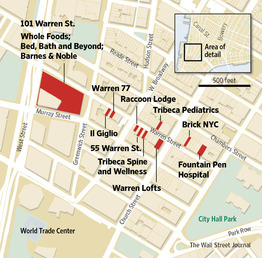 The Whole Foods opened at the intersection of Warren and Greenwich streets in 2008, just two blocks from the World Trade Center. That was followed by 53 Warren St., six-unit loft conversion, and 55 Warren St., where the penthouse features a private endless swimming pool. Now, with few opportunities for new residential construction in TriBeCa, a handful of luxury developers are betting they can fetch top prices for new ultraluxury developments on Warren Street, even though it is busier and more commercial than many of the neighborhood's picturesque streets. Sonny Bazbaz, president of Bazbaz Development, is developing an 18-unit condo at 37 Warren St.—where the top-floor penthouse could fetch as much as $6.5 million when units formally hit the market next week. Mr. Bazbaz was formerly an executive at Fisher Brother and Madden Real Estate and has overseen the development of hospitality projects in Las Vegas. But 37 Warren is his company's first residential project. He bought the site from the bank when it was in foreclosure proceedings for a total acquisition cost $15.5 million. Mr. Bazbaz, who used to live around the block from the building, which was formerly home to the headquarters of a seed-distribution company, said he decided to buy it because he loved its arched ground-floor windows and believed that the block was transforming around it. 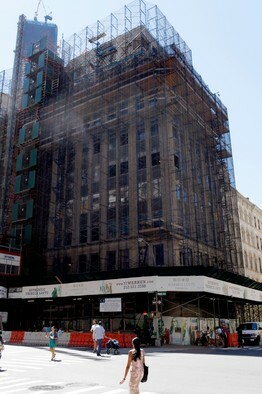 "We've started to see an evolution of TriBeCa and the center of gravity really move toward the south," said Mr. Bazbaz. 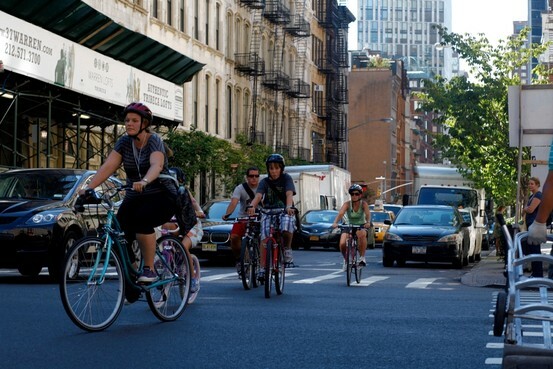 "Over the last five years, it is become more and more prominent as a residential street." 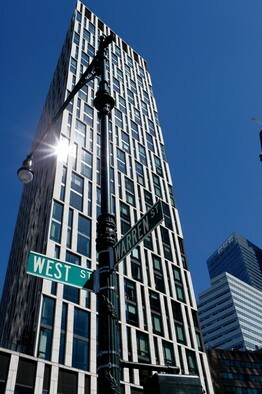 James Lansill, a senior managing director with Corcoran Sunshine, which is marketing the project, also said the developers hope to capitalize on the fact that there is little new inventory currently available in TriBeCa. "There's going to be a pause before other developments open," he said. Joe McMillan, chief executive of DDG Partners, which built the boutique luxury building 41 Bond St., is planning a similarly upscale 15-floor condo at 12-14 Warren St. He recently acquired the distressed site for $14.8 million. Mr. McMillan said the street's transformation can be partly credited to the heavy investment in the area since Sept. 11. The residential population of Lower Manhattan has jumped from about 22,000 residents in 2000 to about 60,000 today, according to the Downtown Alliance, a local business advocacy organization. "The World Trade Center is revitalizing the entire business district," said Mr. McMillan, who also pointed to the new headquarters of Goldman Sachs Group Inc. as bringing affluent workers and residents to the area. "The entire area has been rejuvenated," he added. Thus far at least, the influx of more-affluent residents has been welcomed by a number of longtime businesses. "Twenty-eight years ago, you'd be lucky to see 100 people a day who'd walk on the street. Now you see 100 people every half-hour at least. 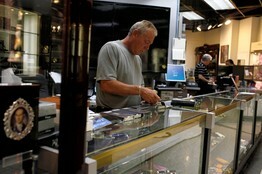 Everything is turning residential down here," said Steve Wiederlight, the 60-year-old owner of Fountain Pen Hospital. 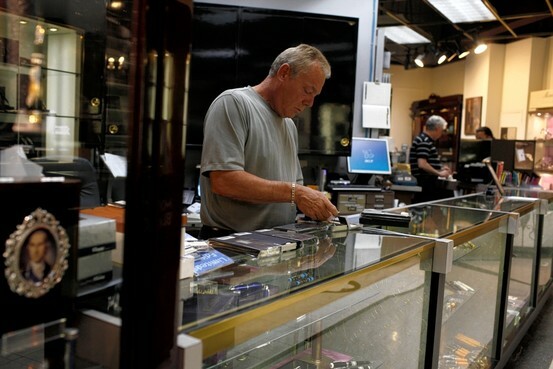 The store opened in 1946 and offers hundreds of new and vintage pens. The street has also seen new retail and services spring up, including TriBeCa Spine and Wellness Center and TriBeCa Pediatrics. 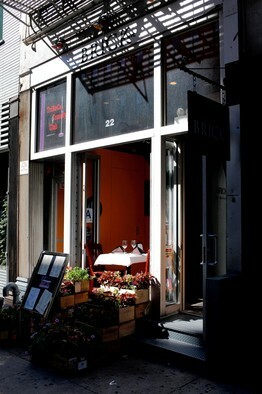 In addition, a handful of restaurants, shops and bars, including Italian eateries Brick NYC and Il Giglio, as well as New York Vintners, a wine-tasting store, have opened. A high-end sports bar, Warren 77, is co-owned by former New York Ranger Sean Avery. "It's absolutely fantastic," said Pamela Graf, one of the owners of Il Giglio, said of the area. "Beautiful buildings used to be parking lots. [It] used to be nothing but parking lots. We've really seen amazing changes," she said, adding: "When the World Trade Center reopens, [there will be] nothing but great things." This is a full-floor penthouse with three bedrooms and four baths. Property Plus: A 300-square-foot terrace faces the Hudson. 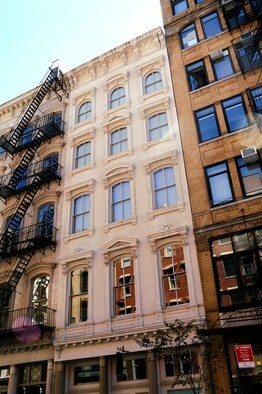 Property Minus: Purists may not like that the penthouses are in a new addition on top of the original building. This is a four-bedroom duplex loft penthouse with 4½ bathrooms. Property Plus: Asking price was reduced $3 million two weeks ago. Property Minus: Doorman-concierge is part-time. This one-bedroom, 1½ bathroom unit has floor-to-ceiling windows. Property Plus: Master bath has rain shower and deep soaking tub. Property Minus: The building has a couple hundred units, which may not appeal to some. The U.S. Economy: Doing Better, Can It Last? Opinion: What Would Milton Friedman Say? Shuanghui's deal for Smithfield indicates how China's shifting dietary profile increasingly puts meat, dairy and processed-food producers into play. States should require drivers of self-driving cars to get extra training and special licenses to show that they can safely operate the vehicles on public roads, the National Highway Traffic Safety Administration said. Many small businesses expect their costs to surge in 2014 because of the Affordable Care Act's employee health-insurance rules but concede they are using back-of-envelope calculations based on partial info. Dish's last-minute bid for Clearwire complicates an already dizzying set of telecom deals and creates a variety of scenarios that are sending stocks in varying directions. Thursday's high temperatures will be even more abnormal for late May and certainly constitute air conditioner weather, maxing out around 90 degrees for much of the region. When fog drifts over the city, as it did this week, there's a brief moment when New York's skyline fades from the view of sky-gazing tourists and residents. See more photos of New York under the cover of fog in our slideshow. Opinion: Did Holder Commit Perjury? Should shareholders have an annual binding vote on director pay? Crown Capital Eco Management: The Great Renewable Energy Scam: Is There A Change in the Wind?